SPOKANE, Wash. (AP) -- Republican Congress members from the Pacific Northwest are upset with a federal judge's order to spill water from four Snake River dams to help speed migrating salmon to the Pacific Ocean. "Dams and fish can co-exist," Reps. Cathy McMorris Rodgers and Dan Newhouse, whose Washington districts include the dams, said in a joint statement. McMorris Rodgers and Newhouse have introduced a bill that would prevent any changes in dam operations until 2022. The measure was co-sponsored by Republican House members from Oregon, Idaho, Montana and Nevada, along with Democratic Rep. Kurt Schrader of Oregon. It passed the House Natural Resources Committee on Wednesday and heads to the floor in coming weeks. "Without Snake and Columbia river dams and the many benefits they provide, life in central Washington as we know it would be unrecognizable," Newhouse said. 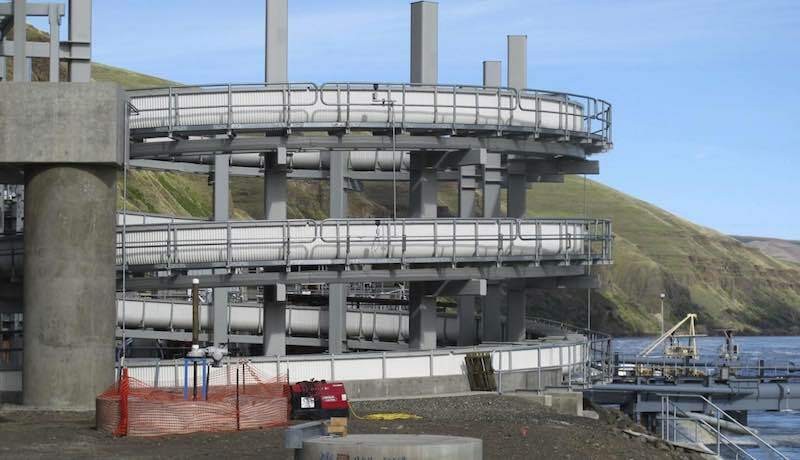 Hydropower is the Northwest's lifeblood, said Republican Rep. Raul Labrador of Idaho. "For a liberal judge to ignore the broad scientific consensus of the federal government and the states of Idaho, Washington and Montana is unconscionable and must be stopped," he said. The increased spill will cost some $40 million in lost power sales, and could hurt transportation and barging on the rivers, flood control and irrigation systems, Republicans contend. But Democrats argue studies of the dams, including whether they should be removed, must go forward. Democratic Sen. Patty Murray of Washington recently sent a letter to House and Senate leadership saying the river's management must include salmon recovery. The letter criticized the bill to prevent changes in dam operations. It was signed by Murray and Democratic Reps. Adam Smith and Pramila Jayapal of Washington. "The Columbia and Snake River system is essential to the Pacific Northwest's culture, environment and economy," the letter said. Replacing that power would require the equivalent of two nuclear power plants, Labrador said. A new study contends other renewable sources could replace the dams' power for a little more than $1 a month for the average Northwest household. The study "explodes the myth that we can't have both wild salmon and clean energy," said Joseph Bogaard, director of the Save Our Wild Salmon Coalition. "We can remove these four deadly dams, restore one of our nation's great salmon rivers and improve the Northwest's energy system." But supporters of the dams say wind and solar power are too unreliable to replace the lost hydropower. The Columbia-Snake river system holds more than a dozen imperiled salmon runs, and the federal government has spent more than $15 billion since 1978 on efforts to save the fish. But those efforts have pushed wild salmon, orca and other fish and wildlife populations closer to extinction, Bogaard said. Removing the dams is the only way to save the salmon runs, conservation groups say. "Salmon are in desperate need of help now," Earthjustice attorney Todd True said. Advocates for fishermen also hailed the decision to increase spill, saying it will produce larger adult salmon returns. Proposals to remove the four dams have percolated in the Northwest for decades, and have devolved into a largely partisan issue with Democrats generally on the side of the fish and Republicans for keeping the dams. The latest skirmish began in March 2017, when U.S. District Judge Michael Simon of Portland, Oregon, ordered the dams to increase spill beginning this spring. Federal agencies have estimated increasing spill until mid-June will cost electric ratepayers $40 million in lost power revenues in 2018 alone. The 9th U.S. Circuit Court of Appeals in early February rejected an appeal of Simon's order. The dams operate under a plan created by a collaboration of federal agencies, states and tribes during the Obama administration to protect salmon. But Simon found it does not do enough. He ruled a new environmental study is needed, and it must consider the option of removing the dams. Simon also wrote that wild salmon were in a "precarious" state. That was disputed by Terry Flores, executive director of Northwest RiverPartners, a group that includes farmers, utilities, ports and businesses. Flores contended spilling so much water from the dams injects high levels of gas into the water, which can kill fish. The churning water at the dams also can prevent the next generation of returning salmon from accessing fish ladders and keep them from reaching spawning streams, she said. "It's a bad plan that will cost families and businesses, do little to help, and may even harm protected salmon, and add tons of carbon to our air," Flores said of the spill. "We shouldn't throw good money at a bad plan."